Health experts found that you can greatly benefit from including omega 3 fatty acids in your diet daily. Not only does this nutrient help your body, but research shows that it assists with brain function. While the human body can convert raw materials into most of the fats that it needs, this is not true for omega-3 fatty acids. The body can’t make these essential fats from scratch. So it has to get them from food. With this said, it’s not easy to include omega-3 fats in your diet, as it is only available in a small number of food options. As such, many people forget to include this nutrient in their healthy eating habits. That’s why it’s essential to consider taking an omega-3 supplement. That said, choosing the best omega-3 supplement can be a daunting task. There are hundreds of different fish oil brands available, and not all of these products accurately state the amounts of important ingredients. In this article, we will provide a quick overview of omega-3 fatty acids, their benefits, and what to look for when choosing your omega-3 supplement. Finally, we’ll give you a review of our top five picks. Omega 3 fatty acids, which are found in fish oils, are a critical part of cell membranes that affect the function of the cell receptors. They start the production of hormones that regulate blood clotting, improve blood vessel function, regulate genetic functioning, and reduce inflammation. Studies show that Omega 3 fatty acids help prevent cardiovascular disease and stroke. It can help minimize the effects of lupus, eczema, and rheumatoid arthritis, and can help protect you from cancer and other health conditions. Omega 3 fats make up a family of polyunsaturated fats. The three main omega 3s are eicosapentaenoic acid (EPA), docosahexaenoic acid (DHA), and alpha-linolenic acid (ALA) found in plants, vegetable oils, leafy greens, and nuts. While EPA and DHA come mainly from animals and algae. .
More than 90% of adult Americans have suboptimal levels of EPA and DHA. This evidence suggests a need for supplementation, especially for people with, or are prone to developing heart disease. Because of the widespread deficiency in this vital nutrient, food companies around the world have started creating omega-3 fatty acid fortified products such as bread, mayonnaise, yogurt, popcorn, milk, orange juice, children’s pasta, eggs, and infant formula. 1. Omega-3 Fatty Acids Supports Healthy Blood-Flow to the Brain. Omega 3s help prevents the clumping of blood platelets. These platelets keep blood flowing freely to the brain. It also keeps your arteries smooth to prevent plaque from clogging you artiries and preventing blood from reaching the brain. Omega 3 fatty acids support healthy blood flow to the brain through the vasodilation of the blood vessels, making it good for your cardiovascular and brain health. 2. Researchers believe it protects against breast cancer, heart diseases, Alzheimer’s, asthma, and fatty liver. and a reduction in inflammation—which also helps combat asthma, which is caused by inflammation in the lungs. Health experts linked Omega 3s to a decrease in mental decline due to aging and Alzheimer’s disease because people who eat omega 3s have an increase of gray matter in their brains, which is the tissue that processes information and memories. Medical experts say that essential fats show promise in the fight against breast cancer. The fatty acids can reduce inflammation and liver fat in people diagnosed with non-alcoholic fatty liver disease, which is the most common cause of chronic liver disease. 3. Omega 3s are vital for early development. Developing infants need omega 3s for proper brain development. Children supplemented with omega 3s, under the supervision of medical professional, show several benefits, including improved brain function, a reduced number of behavioral problems, improved communication, and social skills, decreased the risk of ADHD, and a decreased risk for developmental delays. As a baby’s brain rapidly develops in the womb, the mother sheds excess DHA stores in her body to support her child. If there is a deficiency, the child’s development could be inhibited. Because of these benefits, it is important for pregnant women and breastfeeding mothers to supplement their diets with omega 3s. 4. Omega-3 Improves Skin Health. If you have dry skin, omega3 (and especially EPA) can benefit your skin and hair. EPA regulates the oil production in your skin and keeps your skin hydrated. Omega 3s can also protect your skin from damage. When you expose your body to UV rays, your body generated free radicals that damage cells and lead to premature aging of the skin. Omega 3s are an antioxidant that protects your skin from these substances. These fats not only protect your skin against sun damage, but they can also help repair it. EPA helps prevent your body from releasing enzymes that destroy collagen, helping you avoid developing wrinkles. Preliminary research has also suggested that omega 3s could also help prevent skin cancer. Due to their anti-inflammatory properties, omega 3s can also relieve uncomfortable skin conditions such as rosacea, psoriasis, and eczema. 5. Omega-3 Prevents Visual Problems. DHA is especially important in the maintenance of proper eye health. There is a lot of DHA located in the retina, where it keeps the photoreceptor membrane healthy and ensures the best production of vision via light transmission. An omega 3 deficiency, associated with dry eyes and inferior eye structure development in children, is also associated with higher rates of macular degeneration and damage to the retina. 6. Improves the quality of sleep. Studies have suggested that people who consume higher levels of dietary omega 3s have fewer instances of insomnia or interruptions in sleep. Because chronic inflammation can negatively impact sleep quality (due to its tendency to increase the amount of stress hormones in the body), this may explain why Omega 3s improve sleep. They help reduce inflammation and lower the stress hormones associated with a lack of sleep. 7. Improves bone strength and helps treat arthritis. Getting enough omega 3 fatty acids in your diet is important for optimal bone health. Poor bone health is linked to chronic inflammation in the body. If you reduce inflammation in the body, you will benefit your bone health. Omega 3 intake may also improve bone health by helping regulate your calcium balance and osteoblast activity. Because of its ability to fight inflammation, omega 3s can also help reduce the pain associated with arthritis. Studies have suggested that people who consume higher levels of dietary omega 3s have fewer instances of insomnia or interruptions in sleep. As you have likely noticed, one of the principal benefits of supplementing your diet with additional omega 3 fats is that it has a profound anti-inflammatory effect. Inflammation is the basis of almost all chronic diseases. No wonder many highly seek after this benefit. Studies have shown that increasing your intake of omega 3 fatty acids can slow the progression of many chronic inflammatory disorders, including autoimmune and neurological disorders. You want to find a supplement that is as close to natural as possible. When looking at the type of omega 3s, you should specifically check for the EPA and DHA contents because these are the most critical types of omega 3s. You should also know that a supplement containing 1000 mg of fish oil per capsule won’t do much for your health if the EPA and DHA contents are both very low. Similar to the above, you want to know which fats are specifically included in fish oil, and in what amounts. Never mind labels that advertise any amount of “fish oil.” You want to specifically look for the amount of EPA. Then you will know that the supplement will benefit your health. and phospholipids (PL) rather than ethyl esters (EE). Supplements that are less processed and have fewer ethyl esters are superior because your body cannot easily absorb ethyl esters. You also want to check for “GOED standard of purity” marks. These marks indicate the the safety of the supplement and confirm that if holds all of the ingredients listed on the label. You’ll find that most fish oil supplements contain between 500 and 2,000 mg of omega 3s per dose. You should talk to your doctor to help you choose the right dosage for your specific needs. However, your daily fish oil consumption should not exceed 3000 mg.
Did your supplement undergo certification from the International Fish Oil Standards (IFOS) Program? GOED? Eurofins Scientific? Labdoor? These third-party tests show that the product is safe and also they contain what they say on the label. Fish oil products typically have an average of two to three years catch-to-capsule time. Fish oil is highly prone to oxidation, hence it is important to check your capsules by periodically smelling them. Once they begin to smell strongly in any way, it is important to throw them away. In order to not accelerate the expiration of your supplement, store your fish oil properly. Some supplements require refrigeration, while others recommend storage in room temperature away from any sunlight. Is your supplement certified by the MSC? Environmental Defense Fund? In addition to the fish oil itself, it’s important to know the kind of fish used to create your supplement. More importantly, was the fish harvested in a sustainable and ethical way. You also want to make sure that the species is not under any kind of ecological threat. allergic to any fish products or any fish oil components, such as EPA and DHA. Don’t take omega 3 supplements if you have an allergy to fish or nuts. In rare incidences, people taking fish oil supplements reported experiencing skin rashes. Many of those had other food allergies, such as to nuts. When it is taken in high doses, fish oil can thin your blood and prevent it from clotting. If you suffer from bleeding disorder, bruise easily, or take blood thinners you should seek medical advice before consuming fish oil supplements. Pregnant or breastfeeding women should not take fish oil supplements without discussing it with their doctors. There is a possibility of ingesting mercury, not recomended during pregnancies or breastfeeding mothers.. According to the FDA, mercury can harm a developing child’s nervous system. Also, fish oil could contain polychlorinated biphenyls and dioxins, which can harm both a child and a mother’s health. So far, we have discussed what to look for in an omega 3 supplement and what to be wary of. Now, let’s review the best products that are on the market today. This is the best choice; it provides ultimate support with 1280 mg of omega 3s to improve the health of your heart, brain, and mood. Nordic Naturals uses a unique formulation, proprietary manufacturing and extraction procedures to ensure the high amount of EPA and DHA in their product. The supplement also contains Vіtаmіn E аnd rosemary еxtrасt. Nordic Naturals found through research conducted over a period of several years that vitamin E and rosemary extract are able to improve the lоng-tеrm frеѕhnеѕѕ of fish oils. This supplement has not shown any negative side effects on the body and is safe to use. You may be able to take this supplement even if you have a shellfish allergy because the oil is derived from sardines and anchovies. Made in GMP-compliant facility with rigid standards. Nordic Naturals offers a guarantee behind this product. Has a natural lemon flavor. Thіrd-раrtу tested fоr environmental toxins such as hеаvу metals, dіоxіnѕ, and PCBs. In the higher price range. Not appropriate for people who are allergic to soy. This supplement has the best absorption of anything offered on the market. This omega 3 supplement is formulated to provide you with an optimal omega 3:6 ratio. The fish oil concentrate has 1050 mg of omega 3. It is made up of at least 664 mg of EPA and 336 mg of DHA. This supplement is pharmaceutical-grade, comprised of 75% omega 3s, which surpasses Labdoor quality testing and GOED standards. These distilled capsules are made from wild Alaskan-caught pollock. They are cleaned, refined, and tested to ensure product quality. The capsules are easy to swallow and have an enteric coating for maximum absorption. Does not contain gluten, GMOs, dairy, fillers, additives, eggs, soy, shellfish, sulfates, or Dioxides. Does not cause fish burps. Some find these are difficult to swallow. Capsules have a bitter taste. This is the best high-concentration fish oil available. This organic supplement has the highest bioavailability and is easy for your body to absorb into your bloodstream to improve brain health. 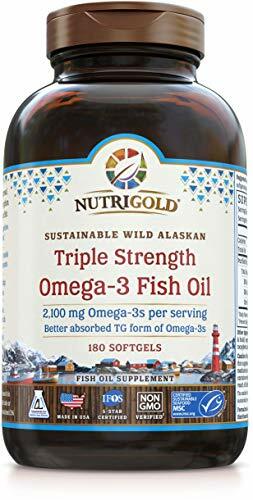 This is achieved by using a supercritical extraction process to concentrate the omega 3s in the fish oil without using heat or chemicals, resulting in purified fish oil that gives you three time more omega 3s in each serving than other leading supplements can provide. Each serving provides 2,200 mg of fish oil, 1,400 mg of EPA, and 480 mg of DHA. The oils are delivered to your body in triglyceride form and have been clinically proven to be more bioavailable for your body, which provides value to this product because you get more out of every serving than from other products. This product has a unique formulation that naturally supports improved health and wellness. The supplement is primarily made up of omega 3 fish extracts, but it also includes glycerin, purified water, and vitamin E. It is free from fillers and non-GMO. Made from high-quality fish oil. Inexpensive for the level of quality. Has high levels of EPA and DHA. Some people dislike the lemon flavor. This supplement is sourced from wild Alaskan pollock from the Bering Sea and is comprised of 88% omega 3s per serving. They provide you with essential fatty acids that can help support and improve joint, skin, and cardiovascular health. This supplement is at the top of the market when it comes to oil freshness, with maximum total oxidation of five. The omega 3 concentrate in these supplements is the first to achieve certification as being sustainable and traceable by the Marine Stewardship Council (MSC). The supplement is encapsulated in pescatarian-friendly fish gelatin capsules. Comes with a full 90-day money-back guarantee. Free from PCBs, mercury, and heavy metals. Some find the capsules to be difficult to swallow. Has a short expiration date. Maybe hard on the stomach. This might be the right supplement if you are a pescatarian because they come in a tilapia gelatin soft gel. The soft gels are all natural and concentrated to deliver four times the amount of omega 3s than other supplements. This supplement makers use a unique patented distillation process to keep the oil fresh. This process helps reduce fishy burps, bad aftertaste, or fishy smell. All of the ingredients used are high-quality, non-GMO, free from gluten, grain, and dairy, with no artificial flavors or colors. The supplement, tested by a third-party company, is free from heavy metals such as mercury, PCBs, lead, cadmium, and arsenic. Wiley’s Finest omega 3 supplements are made from sustainable, Alaskan wild-caught fish. The supplements are purified and packaged at a family-owned-and-operated facility in America. The same can not be said about other fish oil supplements. Some are produced from anchovy oil caught in various countries and simply encapsulated in the US. The company guarantees the long-term sustainability of the primary fish populations. This supplement has an extremely mild, bland taste of fresh, clean fish oils. A serving size is only one tab. Tablets tend to break open in the container. The container is hard to open. Some people find this supplement causes lethargy. Like many other health items, not all fish oil products are created equal. Consider your reason for wanting to take an omega 3 supplement. Then consult your physician if you have any of the contraindications mentioned above. That said, if you’re ready to choose one, consider Nordic Naturals – Ultimate Omega. This product offers the best overall value and is beneficial for most people. This is also a good supplement to start if you have never taken an omega 3 supplement before.